Voted "Among the Best Home Inspectors"
2015, 2014, 2013, 2012, 2011, 2010 & 2009, by the readers of the Killeen Daily Herald. Voted among the "100 Best Businesses" in Central Texas - 2015, 2014, 2013, 2012, 2011, 2010 & 2009. You can have confidence in choosing Quality to perform your home inspection. Give me a call --- I will work with you to get your inspection scheduled promptly. I have over a decade of experience in residential and commercial inspection. 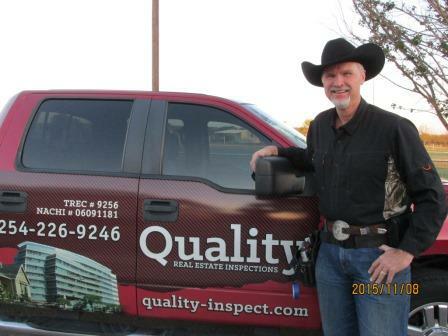 I am licensed and insured to perform residential and commercial property inspections in Texas. By law, as a licensed Texas Professional Home Inspector, I must adhere to the Texas Real Estate Commission's Standards of Practice. I am a member in good standing of interNACHI and I also follow their standards of practice and code of ethics. I am a graduate of Kaplan University-Dallas - School of Professional Real Estate Inspection. Further, I fulfill at least 16 hours of continuing education with Texas A&M University every year to maintain my certifications. Ft. Hood Area/Temple-Belton Realtors Association & Waco Area MLS Key. I generate thorough easy to read inspection reports complete with exterior & interior photos, and will explain anything about your home in more detail - just ask me. If you have any questions after moving into your new home, I am only a phone call away. If you honor me by permitting me to inspect the home that you have chosen, I guarantee that I will give you my very best effort and earn not only the reasonable inspection fee, but most of all - your respect. This I sincerely promise you! Thanks for allowing me to help you. Thank you for inspecting our house, I really appreciate your thoroughness with everything and that you took the time to go back the next day to check the electrical. I will recommend you to others who ask for a home inspection. Have a blessed day.